The K20A VTC (Variable Timing Control) is designed to work with the standard pistons and camshafts. If used with either high lift camshafts and/or high compression pistons, the standard VTC and standard ECU settings may cause the valves to come close or in some cases touch the piston. (TODA’s A3 cam and larger require the clearance to be checked). Retaining the VTC system for the advancing of any high lift cam brings benefits to low end power and low speed drivability. Though even when the ECU is able to control the amount of advance that the cam can rotate through, it is difficult to know precisely how far the VTC has actually advanced. With tuned engines the full amount of advance can lead to no or very little clearance. TODA Racing has designed a range of mechanically limiting advancing cam-sprockets to prevent over advancing of the intake camshaft. 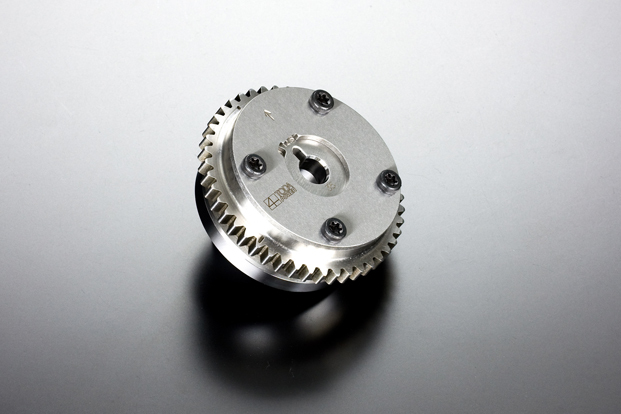 Please choose from the range below the cam-sprocket which suits your particular application. Remarks *K20A standard VTC has the range of 50degs. *Indicated angle is the crankshaft angle.